Fun Things to do in Vancouver! Take a Drive up the Sea-to-Sky Highway:Rated as one of the most the beautiful drives in the world, the Sea-to-Sky corridor takes visitors on a 1.5 hour long journey, from the heart of downtown Vancouver to the world class ski town of Whistler. With waterfalls, jaw-dropping vistas, a stunning cultural center and a suspension bridge along the way, you’ll want to pack a lunch, your camera and gas up the rental car, because this journey is one you won’t want to miss. 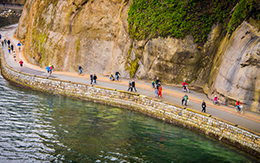 Cycle Around Stanley Park: The votes are in and the crowd has spoken; Vancouver’s Stanley Park managed to elbow out the likes of New York’s Central Park, the Luxeumbourg Gardens in Paris and Chicago’s Millennium Park to be named the World’s Best Park by Trip Advisor. So why is it so great? Where else in the world can you cycle all the way around an old growth forest, visit ancient Aboriginal village sites, steal a tan at the beach, lounge around a rose garden or get up and close with sea lions and Pacific dolphins. There are a handful of bicycle rental spots at the base of Denman Street, and its the best way to get around the park. Windowshop in Gastown: Vancouver proper began in the heart of what is now a trendy neighborhood called Gastown, named after a historical figure known as “Gassy Jack”. Once Canada’s third largest city, “Gastown” in 1867, was the site of various lumber mills, Gastown is now home to chic loft apartments, European eateries, cocktail lounges and flashy boutiques. There are a few galleries of note along Water Street, and plenty of places to buy Canadiana. Dim Sum in China Town The great thing about sightseeing in Vancouver is it’s easy to knock off multiple things in one visit to any of its unique neighborhoods. Vancouver’s Chinatown is one of the oldest in Canada and the largest. Perched on the edge of the Downtown Financial District and Gastown, Chinatown offers up an array of funky shops, inexpensive markets, and of course, the best Dim Sum restaurants in town. Sunday is the busiest day for Dim Sum, but also the best with multi-generational families sitting down and chatting about the week’s events. Find Your Zen While you’re in the neighborhood, Chinatown is home to one of Canada’s most impressive Chinese gardens, Dr. Sun Yat Sen. What makes it so exquisite is its unique construction. Constructed with wholly traditional methods (by hand), the site mimics complex gardens found on the Mainland with courtyards, meandering brooks, impeccably sculpted vegetation, all in keeping with the Confucian and Buddhist tradition. Kayaking in Deep Cove:If getting up close and personal with mother nature is your idea of the perfect day out, ocean kayaking is one of the most popular things to do in Vancouver, and Deep Cove is one of the best and safest places to do it in Canada. A tranquil paddle up Indian Arm, a picturesque fjord where the forests creatures come down to the water’s edge to greet you with curiosity. Take an Aquabus to Granville Island:No visit to Vancouver is complete without a visit to the artsy Granville Island. Interestingly, it’s more a little peninsula than an island. What was once an industrial manufacturing hub, is now the meeting place for well-to-do Vancouverites and tourists to shop for the organic produce, sip on premium teas, sample fine chocolates, listen to buskers, and watch sleek yachts sidle on up to the dock. High Tea at the Fairmont:Why not combine two of Vancouver’s oldest traditions? Taking high tea in a hotel that has roots back in the days of the railroad. Head over to the Fairmont Hotel Vancouver and take the elevator up to the 15th floor. A sumptuous spread awaits with the finest Fairmont teas, impeccable finger sandwiches, scones, and of course, what would any activity be in Vancouver without sweeping city views. Visit the Richmond Night Market:If you’re here during the summer months, which is best time to visit, the Richmond Market is one of the most interesting markets to wander through. Home to Vancouver’s largest Chinese community, Richmond puts on quite the show, with endless stalls of trinkets, and interesting foods, and art demonstrations. Take a Foodie Tour:Vancouver is the most ethnically diverse city in the world, which means, if you can dream up a style cuisine, it’s probably here. Its culinary influences are infinite, from the freshest sushi, to the most rustic farm-to-table, you could easily take a tour around the globe eating here, so why not let someone do that for you and hop on a foodie tour. Pair the complex food scene with an exploding craft beer and wine industry and you have yourself the makings of a perfectly delicious day! Wander Van Dusen Botanical Gardens: Garden enthusiasts from around the world love wandering the tranquil 22 acres of Vancouver’s Van Dusen Botanical Gardens. The great thing about this paradise in the city is you can visit it all year round. In the warmer months, pack a picnic, take a stroll down Laburnum Walk, and find a find a shady spot to enjoy the fragrant garden. The garden takes you on a tour of the world’s eco system, all in one place. 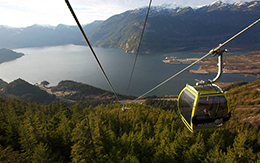 Sea-to-Sky Gondola: We’ve already suggested you head up the sea-to-sky corridor, what we haven’t delved into are all the amazing things you’ll find along the way like the Sea-to-Sky Gondola, one of Vancouver’s newest and most exciting attractions. Vancouver is all about spectacular views, and the 100 meter long Sky Pilot Suspension Bridge provides 360 degree views of all the Squamish region has to offer. From rugged mountains above to the vibrant turquoise fjord below, you may not want to come down. 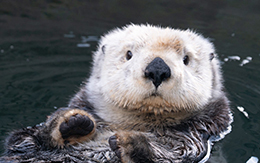 The Vancouver Aquarium: If you’ve ever wanted to get up close and personal with what lies beneath the frigid waters of the Pacific Ocean, or what’s living above in canopies of the Brazilian Amazon, the Vancouver Aquarium gives you that opportunity. One of North Americas largest aquariums, and conveniently located in the heart of Stanley Park, this attraction is one of the most popular things to do in Vancouver. There is lot’s to see, and as the Aquarium sees a regular rotation of unique exhibits, you may want to give yourself at least a day to come nose-to-nose with Belugas and learn about how essential the salmon is here in the Coastal ecosystem.